"I've felt like this has been my team for a long time. A leader doesn't stand out. He stands in. CLEARWATER, Fla. - It was after a 14-inning game in Washington which Jimmy Rollins won with a two-run triple that he uttered those words. Veteran catcher Mike Lieberthal was still a Phillie, but his exit was imminent. So, Rollins felt comfortable saying what he felt. That comfort level has only grown as he becomes more entrenched as the team's leader. Rollins arrived yesterday for the first full workouts swathed head-to-toe in Air Jordan gear, Fonzie in silky sweats and sneakers. As other players orbited his presence wearing practice togs, Rollins remained in his Nike apparel. He munched Chick-fil-A for breakfast, holding court in the middle of the clubhouse. This is his time. This is his team. Rollins, 28, has played through the Scott Rolen era, the Jim Thome era, the Bobby Abreu era, all of which included a portion of the Larry Bowa era. Other significant presences, such as David Bell, Lieberthal and Todd Pratt, have come and gone. In their place the emerging talents and personalities of Ryan Howard, Chase Utley and Shane Victorino are enabled by Rollins' presence. Rollins insulates them by painting a bull's-eye on his own back, as he has done this offseason by insisting that the Phillies are the best team in the National League East. His followers appreciate it all. "I'm very focused. I'm very intense," said Utley, a helmet-slammer of the first degree - but his frequent, acerbic witticism became more common once Bell and Abreu were traded near the deadline last season. Why? "Jimmy brings a lot of fun to the clubhouse," Utley said. "You have a good time. You're relaxed. It's a personality we need on the team." "There's always a line," said Victorino, the team jokester, who spends more time in Rollins' South Jersey home than in his own. "We know where the line is. 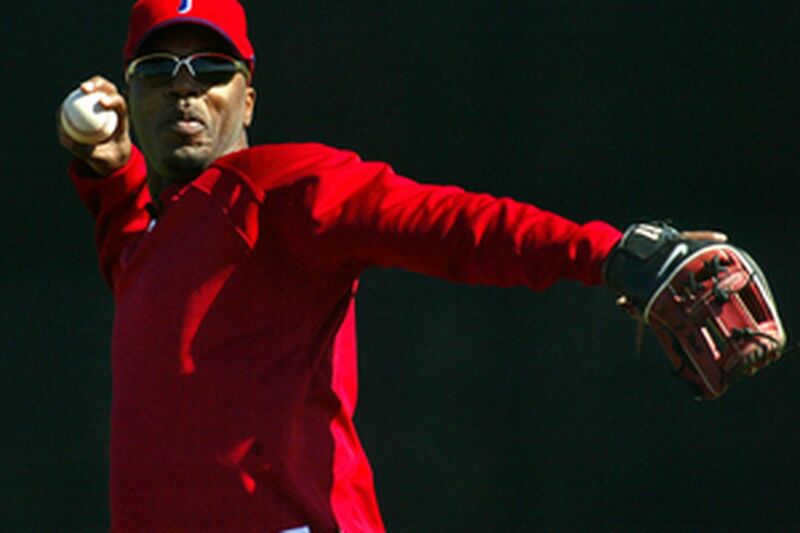 We don't cross it," said Howard, Rollins' roommate during his rookie-of-the-year run in 2005. "We have fun. We get our work done." They do it to Rollins' rhythm. It was Rollins, a three-time All-Star, who called the team meeting last season after the Phillies went 9-18 in June. It was Rollins who - after general manager Pat Gillick admitted that he didn't expect the team to be a viable contender until 2008 following the deadline trades - corralled Pat Burrell, Howard, Utley, Victorino and said, "Let's not wait that long." "I really wanted to prove to him that we were a better team than the paper, the fans, see us as," Rollins said. "He could have been throwing that out there to get our attention. He's a smart guy." The Phillies went 36-23 after the Abreu trade. It was Rollins who repeatedly has said that the Phillies, not the Mets, who finished 12 games ahead of them last season, are the team to beat in the East thanks to their improved starting rotation. Mets third baseman David Wright said he was irked by Rollins' confidence. After he took part in the team's first full-squad workout, he reiterated those feelings and dismissed Wright's concerns. "If they needed motivation to play this game, then they're playing the wrong game," Rollins said. "They had a chance last year to get to the World Series. Last year's over." And this is the Phillies' year? "I want to put that pressure on [his teammates]. And myself." Might that not have an adverse effect? "If you're afraid, then I don't want you on this team, anyway." Since Rollins broke into the majors in 2000, Burrell has had three splendid seasons with the Phillies. Thome had two. Utley has become baseball's best offensive second baseman. Howard is mentioned alongside Barry Bonds and Albert Pujols as the game's most feared hitters. None ever owned the swagger Rollins always featured. That swagger now permeates the clubhouse. "We know we can win. Watch how we interact with each other," Rollins said. Indeed, the policy of his reign falls somewhere between pure democracy and benign, if not benevolent, dictatorship. At his team meeting last year, Rollins simply opened the floor for grievances, which were aired on all sides. More than anything else, he wants players to feel comfortable expressing themselves. That's exactly what manager Charlie Manuel wants. "He's got intangibles. He's a character. He's got personality," Manuel said. "He's a smile. He's energy. What Jimmy has done, just being Jimmy - our team gets lifted by that." Of course, Rollins has plenty to offer besides charisma. He is an imperfect leadoff hitter, with a career on-base percentage of .329, but no leadoff hitter in baseball has scored more runs in the past three seasons than Rollins' 361. Thanks to a marked decrease in his strikeouts, in that span he is a .284 hitter, including a 36-game hitting streak to end the 2005 season, with 107 stolen bases. He set career highs with 25 homers and 83 RBI last year. "There were definitely times last year I walked up to the plate and I knew I was going to hit a home run," he said. He also is tied for the fourth-best fielding percentage in the history of major league shortstops. Perhaps most significant, Rollins never sits out because he's hurt. Rollins, only 5-8 and 174 pounds, has fought thigh, hamstring and left-elbow problems the past three seasons . . . and played in all but 16 of the team's 486 games. Six steady seasons of production, defense, durability earns leadership. Actually, said Rollins, it isn't that he has been a retiring type. "The leadership is the same. I've just been in the background," he said. "I wasn't going to step in front of a Bobby or a Mike . . . I'm not going to step on their toes. You take the shade off, and my light starts to shine through."